The Zebra Mussel is often confused with the Quagga Mussel (Dreissena bugensis). They are generally found living together in the same habitat and are also very similar in appearance, but there are many morphological features that can be used to help distinguish the two species. 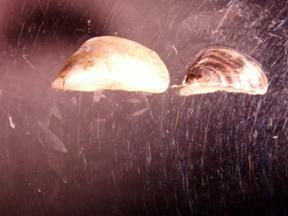 The Quagga Mussel has a rounded angle between the ventral and dorsal surfaces. It also has a convex ventral side. These features can be distinguished when the two mussels are placed side by side. An easy trick to distinguish between the two is if the two different species are placed on their sides, the quagga will tip over, and the zebra will not. 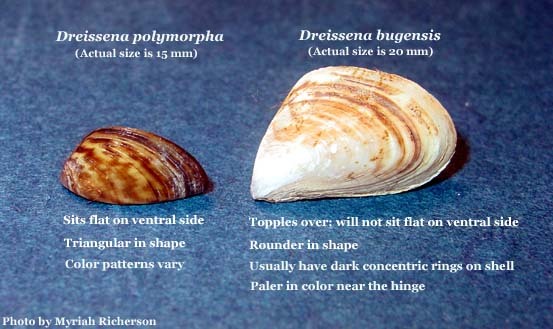 Quagga mussels are also generally rounder in shape. They also are generally paler or sometimes completely white in color. They can have dark rings on their shells and are asymmetrical when viewed from the front.